Enjoy hand-crafted cocktails, tacos, guacamole and other Mexican fare at Bien Trucha, a contemporary Mexican staple on State Street in Geneva. Here’s the scoop on this fantastic restaurant. About the owner: Born in Mexico City, Cano moved to the area when he was 13. Cano’s family has always had restaurants, and he grew up surrounded by the business and the idea of bringing quality food to the people. When he moved to New York City to study audio engineering in college, Cano did not have intentions of working in the restaurant industry. To get through college, Cano worked in restaurants and loved working with such great people and chefs. When working in restaurants in New York City, Cano found that chefs appreciated his passion and appreciation for food, and always asked for his feedback on dishes and cocktails. Cano considers himself an artist and is always experimenting with food and drinks. These restaurants are a mostly family-run operation with Cano’s brother, mother, stepfather, and a couple other investors. Another restaurant they own is A Toda Madre in Glen Ellyn. The group plans to open another restaurant, a new development on Water Street in downtown Naperville in 2016. Mission statement or philosophy: “We try to keep it fresh and as high-quality as possible. When we opened, we had limited space and no walk-in cooler,” Cano said. “It worked out pretty organically. Everything is fresh. We work with some local farms to create a smaller footprint.” Ideas of fresh and quality ingredients are present in every dish and cocktail. The décor: Guests of Bien Trucha feel at home the second they walk in the door. The bistro side of the restaurant is located in an old house. Cozy, but not overdecorated, simple details like an open kitchen, understated light fixtures, and a wall full of Mexican style cookbooks, show that this establishment has nothing to hide and is always happy to share a meal with guests. We’re different because: The open kitchen design is something that is very different for the region. “We have nothing to hide,” said Cano. The cocktails are also top-notch and unlike other restaurants. Going with the same idea of the open kitchen concept, Bien Trucha’s bar drinks include drinks made-to-order in front of guests. 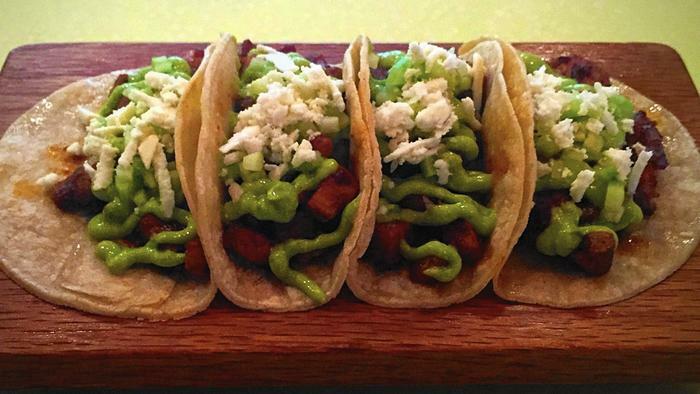 Extras: Bien Trucha rotates tacos and ceviche and has a different guacamole daily. The restaurant also has a featured dish and drink every couple of weeks to help bring something new to its guests. Recently, Bien Trucha partnered with Marz Brewing Company of Chicago to create a mescal-inspired kolsch. This collaboration brew has a smoky taste unlike any other beer. Made with agave nectar and citrus sea salt, the Mescal Kolsch is a beer to look forward to and crave, no matter what the season. Price range: Taco plates with 4 tacos range in price from $9 to $12. Starters like guacamole del dia and ceviche range from $7 to $10. Sides like frijoles refritos, arroz poblano and esquites (a street-style char-grilled corn with butter, lemon aioli, queso cojita and chile pequin) range from $4 to $5. Logistics: Bien Trucha is located at 410 W. State Street in Geneva, steps away from the intersection of 4th Street and State Street, and within walking distance of the Geneva Metra train station. The restaurant is open daily for lunch and dinner. Call 630-232-2665 or visit bientrucha.com.